Cold, brutal, scientific approach to war. 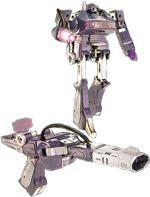 Seeks to overthrow Megatron as leader of Decepticons because he believes logic says he would be better. As laser gun, can emit lethal beams of energy from anywhere on the electomagnetic spectrum: gamma rays, X-rays, visible light, infrared rays, radio waves, etc.. Flies in laser gun or robot mode. High fuel use, but can be powered by nuclear sources. Often confounded by initiave, emotional thinking. The sound of his engines causes petrifying fear in those who hear them. He's a master at handling fear... other Decepticons are put off by his mournful, silent ways. "He gives me the creeps," says Ramjet. He carries two concussion missiles. Needs to control a situation; otherwise, he too falls victim to fear, making him useless as a warrior. Mid-air collisions are his specialty. It makes little difference if the target is an opponent or not, he'll crash into it just for the fun of bringing terror to the skies. These crashes can take their toll on him, particularly doing damage to his internal mechanisms. "The skies are my castle and I like to live alone. ", he says. His nose module can withstand the impact of three-foot thick concrete at 1500mph, and he flies as fast as mach 2.8 while carrying cluster bombs. He rattles the air with the roar of his jets... believes half the battle is won if the opponent is "psyched out" by his mere arrival, so he makes no attempt to be sneaky. Pompus, loud-mouthed braggart and not too brave. Sudden, powerful accelerations can topple nearby buildings. Flies at mach 2.5, can double speed in 20 seconds for up to two minutes. 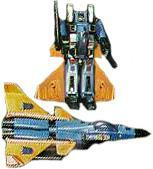 Carries four air-to-air missiles and two automatic missile launchers in robot mode.